With customers like the U.S. Army and the Marine Corps, Boston Dynamics doesn't go out of its way to build friendly-looking robots. But its newest creation, SpotMini, is even creepier than the others. It looks like some sort of dog/giraffe hybrid, but unlike either of those, it's definitely not cute. SpotMini is a smaller version of the company's Spot robot. It weighs 55 lbs (65 lbs if you add the arm). Unlike its hydraulics-powered predecessors, SpotMini is all-electric, which makes it a lot quieter. According to Boston Dynamics, the robot can go for 90 minutes on one charge, depending on what it's doing. SpotMini has a variety of sensors, including depth cameras, a solid state gyro (IMU), and sensors in the limbs to help with navigation. In a video posted on Youtube Thursday, the robot walks around a mock home and does chores like putting dirty glasses in the dishwasher and recycling a tin can (good boy, Spot!) In one scene, the robot even serves as a butler, handing a drink to its master, though not very gracefully. 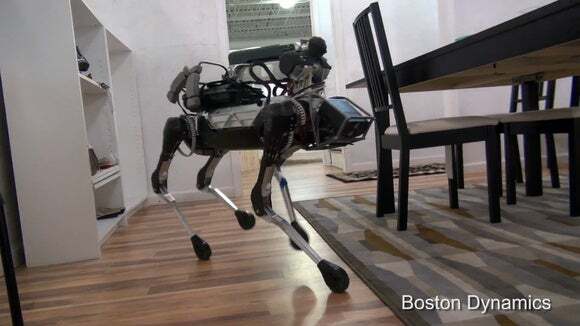 It's not clear why Boston Dynamics showed SpotMini in a home environment, since most of its products are designed for military use. 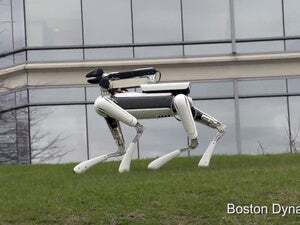 The company is owned by Google, which recently put Boston Dynamics up for sale. Maybe it's looking around for new markets -- haunted house, anyone?